WELCOME TO THE HIGH DESERT! At the Poplars Ranch, we believe in a functional animal that can handle, thrive and succeed in any environment. Efficiency is our main goal, not only in environment, but also in the feedlot. Our cattle are put to the test with harsh country and limited feed. We develop an ambitious herd able to survive and produce in any environment. Poplars' Herefords are efficient and remain in good condition throughout the breeding season. To producing a calf with depth and length of body, we emphasize maternal characteristics such as solid udders, annual calving, and sound feet and legs. 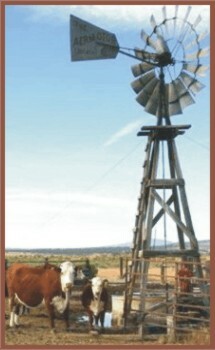 It is our goal that the cow herd, as well as the bulls offered for sale, have good dispositions. We primarily sell 18-month to two-year old bulls because we believe that is a better product for our customers. EPDs are extremely important in our herd. Our cattle have below average birth weight, but above average weaning and yearling weight. Milk EPD must be above 16. Carcass EPDs must also be above average. In our bull production, we strive for a bull that is better than average in all traits. Customer satisfaction is our goal. We market bulls that are efficient from birth through the feedlot, and will excel on the rail. Our bulls are raised in tough, rugged country, travel a distance for water, and are survivors of the fittest.